This next set of trip report posts is from February of this year when I went to Tokyo to cheer on some friends who were running the Tokyo Marathon. I booked flights on American Airlines of SFO-LAX-NRT and back and applied SWUs to the outbound and return that cleared about 3 days prior to departure both ways. Since I was flying an international itinerary, I had access to the AA Flagship Lounge at LAX instead of the normal Admirals Club. The Flagship Lounge requires top tier oneworld status or a first class ticket to enter. This means that the lounge is generally a bit less crowded than the Admirals Club and that there are more food options. To get into the Flagship Lounge, you check in at the same place as the Admirals Club, but they give you a key card to use to open the sliding door to the Flagship Lounge part. The lounge is a large, long room with a number of seating options, good light, and decent views of the apron. I arrived in the morning, so they were serving breakfast. There were a couple of hot food options like eggs, potatoes, sausage, and oatmeal, as well as cereals, fruits, bagels, and danishes. I was pleasantly surprised to see berries in the fruit selection (a big step up in my mind to the whole apples and oranges in normal Admirals Clubs). The eggs were inedible, though. As I was leaving, they had set up the lunch spread, which featured sandwiches, salads, cheeses, chips, vegetables, fruits, cookies, and a kinda nasty looking pasta dish. Granted, I didn’t try the pasta dish, but it didn’t look that appetizing to me. I took a shower during my layover, and the shower rooms were perfectly fine. I felt like the rooms were a little small to handle a suitcase, but they were clean and functional. Overall, the service was good, with people regularly going around to clean things up and ask if you needed anything. The lounge felt busy when I was there, but there were plenty of seats available, and it didn’t feel crowded. Definitely a step up from normal domestic lounges, but still a far cry from most non-US airlines’ first class lounges. 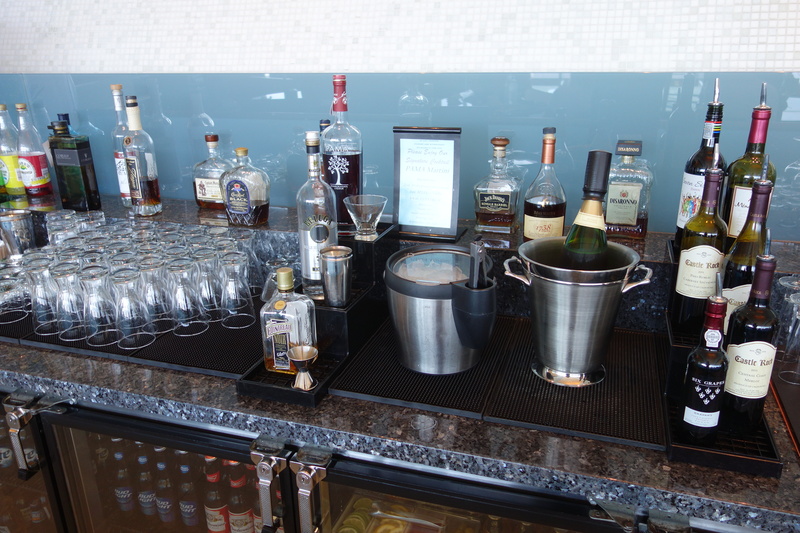 This entry was posted in American, Lounge Reviews, Travel, Trip Reports and tagged airport lounge, american, flagship lounge, lax, travel, trip report on August 26, 2014 by Edward.